This beautiful Lattice Back wood chair with its rare beautiful design and low price, is the best choice for upscale restaurants, bars and other expensive venues. You can choose between a 1" thick solid saddle seat or an upholstered seat with vinyl or fabric. Restaurant Furniture Canada is a prime restaurant seating manufacturer - our wood chairs are made especially for commercial use and constructed to withstand the rigorous demands of the restaurant industry. 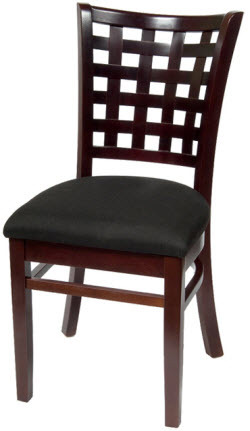 This restaurant chair is assembled with a Mortise & Tenon construction and reinforced with Metal L Shaped brackets. For additional information about this chair please call (888) 998-4222. 17" W x 35.5" H x 22" D ; Seat Height: 18"